Free Downloadable Marketing Materials | Walters Gardens, Inc.
We offer a number of free downloadable marketing materials such as images, display cards, info sheets, and slide presentations to help you grow your business. All of the resources are free, but you will need an account with our website to access them. Please follow the link here to get started! As a value added service to our customers, we offer both high and low resolution images available for downloading from our website. You can find images in the tab of each individual plant record or in our online image database. Which image resolution best suits your needs? Download high resolution images to use in print projects such as catalogs, newsletters, flyers, and labels. Download low resolution images to use in web projects and slide presentations. Our free downloadable display cards are an exclusive privilege for our current customers in good standing. To download display cards from this website, login on the navigation bar and either visit our online display card database or find them on the page of their plant record. If you do not have a login but are a current customer, register here. Though our display cards are available for our current customers to download from our website for free, most have found that ordering professionally printed display cards is the more efficient option in the end. Click here to order professionally printed display cards. Designed to coordinate with our XL labels, posters, and banners, our display cards will help you to create an organized, cohesive look in your garden center. Our display cards feature larger font, large color photos of the plants in bloom, and QR codes. Display Cards are essential for strong sales! Helps customers find the information they need quickly without having to ask for help. Provides specific, accurate information to your customers in today's market where there are so many perennials to choose from. Showy color photos provide impulse appeal when the plants are not in bloom. Helps customers make more informed purchasing decisions, resulting in greater success with the product and potential repeat sales. For your convenience, several PDF Presentations have been created for you and are available for viewing or downloading from this website. These presentations can help communicate information about the perennials you offer and also make a handy reference for your staff. A presentation of new items for the current year is always available as well as presentations on a number of other topics. All text and images contained within the presentations are the property of Walters Gardens, Inc. Please contact us to request the use of the information in any other format. We all understand the importance of signage at the retail level. Labels, display cards, posters, and more deliver the critical information that customers need to make informed purchasing decisions. We offer a range of POP materials which are available for our customers and you can read about them here. In addition, we also offer free downloadable info sheets of our Extreme Perennial categories. We encourage you to download these attractive color slicks to print and distribute to your customers. These lists of perennials can help to guide your customers through your perennial selection to find the plants that suit their needs best. They can also be used as training aides for new staff members. Our "Extreme Perennial" program was developed because, so often, we're asked for advice on which perennials bloom all summer or those that can really take the heat. As we walk our display gardens, fields, and greenhouses all season, there are always some perennials that stand out far above the rest. Now we're delivering all of this great information in the form of attractive color slicks for you to use with your customers at retail. We at Walters Gardens are very excited to partner with MasterTag in order to print and supply our Display Cards. 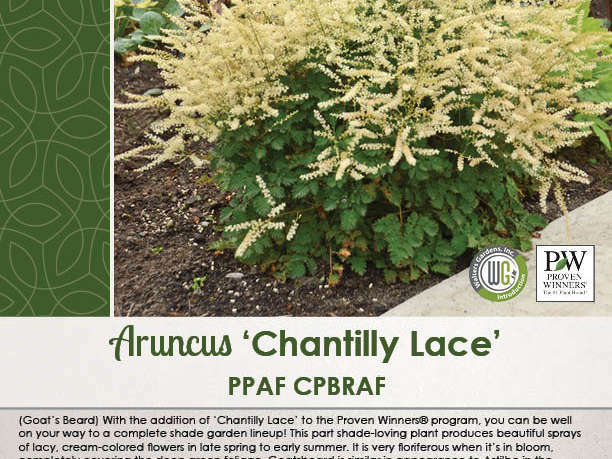 With such a wide variety of perennials available, informative color labels are essential for providing your customers with the information they need to make solid purchasing decisions. Walters Gardens, Inc. has partnered with MasterTag to help you update your garden center this year with fresh, modern POP materials. This heavy duty, premium quality signage is made to withstand typical garden center conditions and will continue to perform for you rain or shine.